It's shocking that this critical piece of knowledge about investing is not known by most people. What if we told you those dollar bills in your pocket were not money? Well, they're not. The dollars in your pocket are the national currency of the United States. 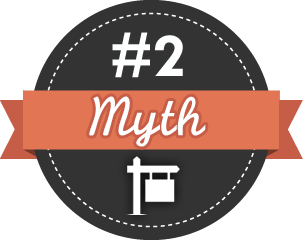 There is a big difference between currency and money that affects your financial future. Throughout the history of civilizations an epic battle has always been waged. It is an unseen battle, unknown by most of the people it affects. Yet, all feel the effects of this battle in their daily lives. This battle is between currency and money, and it is truly a battle of the ages. "Money" is all of the below plus a "Store of Value". 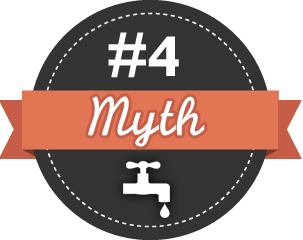 This means money is able to be saved for long periods and retrieved at a later time with its purchasing power unchanged. hen it comes to the history of money, it seems the human race is doomed to repeat the same mistakes over and over again. Mike Maloney believes that "History repeats itself, but usually with a little twist." 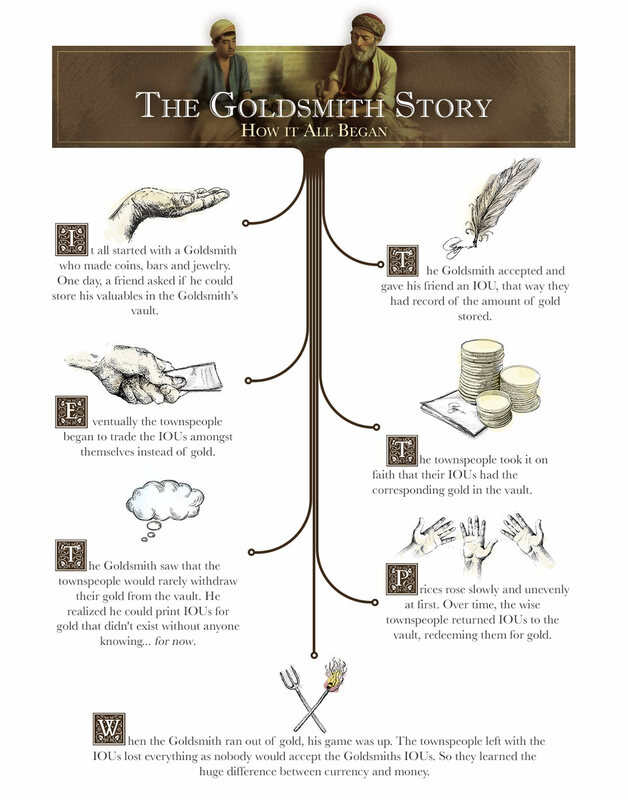 The story of our Goldsmith is a simplified form of what has really happened throughout history. Just like in our story, a country will start out with money, gold and silver, then through debasement will turn that money into currency. Thereby robbing the people of their wealth. Athens became embroiled with its rival in war for longer than anticipated, 22 years, and continued many of their public works. 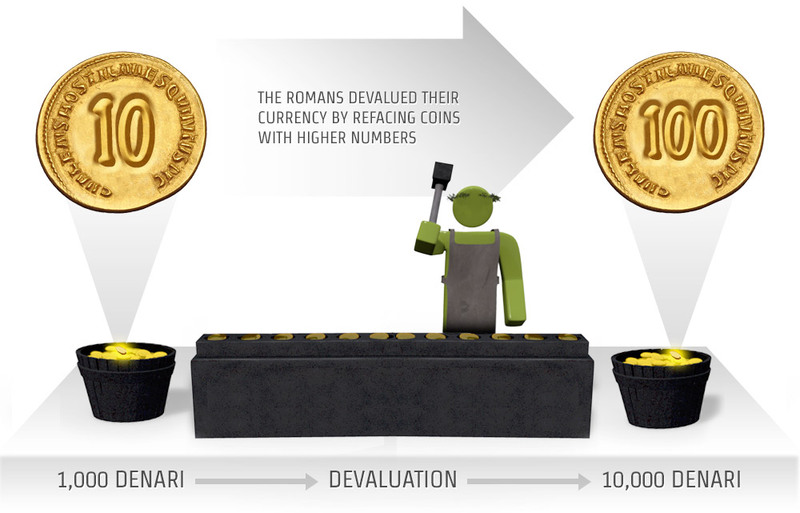 In order to continue funding the war and building public works, they began to debase, or devalue, their coins. With an ever-expanding army, public works projects and rising unemployment welfare, new coins were feverishly minted to cover rampant deficit spending. One of the most interesting cases in history illustrating just how bad the effects of currency creation can be is the 1924 hyperinflation that took place in what is modern-day Germany. When World War I began, Germany went off the gold standard, and its citizens were no longer able to redeem currency (the mark) for gold and silver money. The government quadrupled the number of marks in circulation, but because Germany was going through uncertain times, people saved every penny (pfennig). After the war, Germany made the first war reparation payment to France, spending most of its gold in the process. The German government didn't have the gold to make its second payment. In January 1923, France and Belgium invaded and occupied the Ruhr (the industrial headland of Germany). In the meantime, the German government put its printing presses into overdrive, printing 50 quadrillion marks a day by November of the same year. 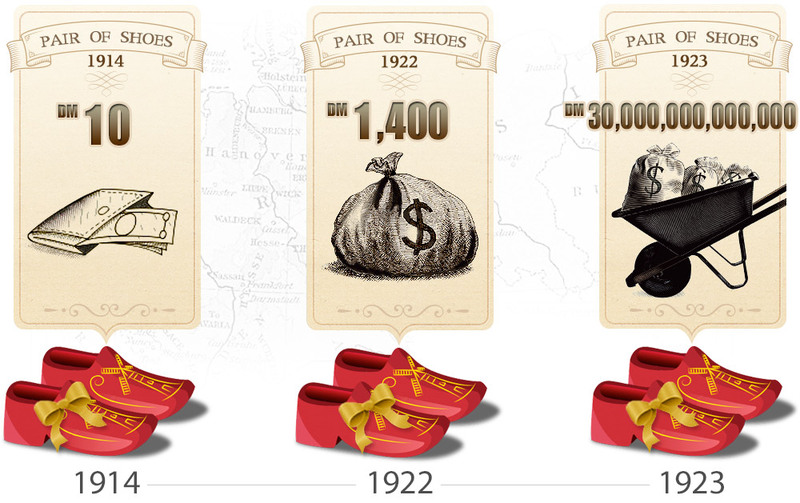 A pair of shoes that cost 12 marks before the war was now worth 30 trillion marks. A loaf of bread went from a half a mark to 200 billion marks. A single egg went from 0.08 mark to 80 billion marks. The German stock market went from 99 points to 26,890,000,000 by the end of the war, but its value had fallen more than 97 percent. Prices really did not "rise" in the way that it is commonly perceived; it was the value and the purchasing power of the mark that fell precipitously as confidence was lost. 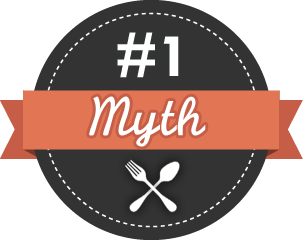 It's true that you can't eat gold and silver, but you also can't eat US Dollars, British Pounds, or any currency. 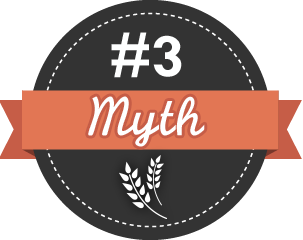 What this myth's implying is that gold and silver cannot buy food as easily as currency. This may be true today, but as people become more disenchanted with the falling purchasing power of currency, they will become more excited about accepting gold and silver money as payment. "When the terrorist attacks happened September 11, 2001 the banks were closed, and ATMs ran out of cash. But the precious metals dealers were open and you could walk in with your gold or silver, and walk out with $100 bills. The precious metals dealers were the banks that week." 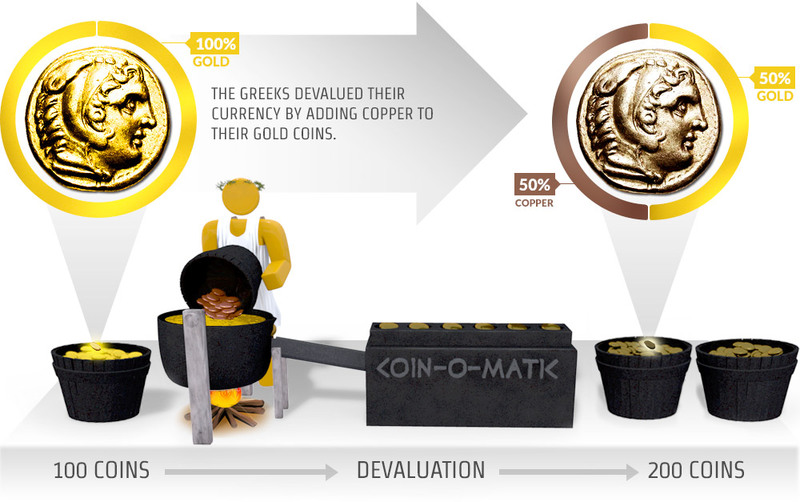 While gold is currently cited as a commodity, it has been officially recognized as money throughout history. In fact, it was officially recognized as such in the US Constitution "No State shall make any Thing but gold and silver Coin a Tender in Payment of Debts"
We can distinguish gold from commodities even further. Commodities like wheat, oil or lumber are all consumed; whereas gold simply accumulates. Gold that was mined 2,000 years ago is still used today. You cannot say that about wheat. Gold is infinitely divisible because Governments can stamp whatever currency number they want on an ounce of gold. This means a gold coin could have a stamp of $50, $500, or $5,000.